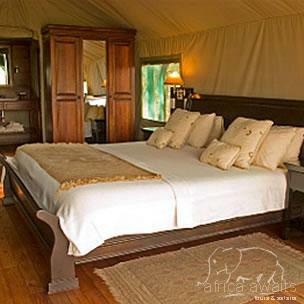 Stanleys is a small luxury camp consisting of 8 classic styled safari tents. The elegantly appointed tents exude classic Africa; hand crafted beds dressed with the finest linen, antique furniture individually selected and oriental carpets that give a delightful glimpse at colonial Africa. Each accommodation unit offers en-suite facilities and a private balcony. Electricity is supplied by a combination of silent packed generator and battery system, allowing 24-hour power supply. Game drives at Stanleys are conduced in open vehicles that offer unencumbered views. The vehicles have been custom built and offer individual seating. The accompanying professional guides are amongst the best in Botswana. Set in an amphitheatre of ebony and sausage trees on the southern tip of Chief'ss Island, Stanleys Camp sits amidst 260 000 acres of untamed and untrammeled African Bush. 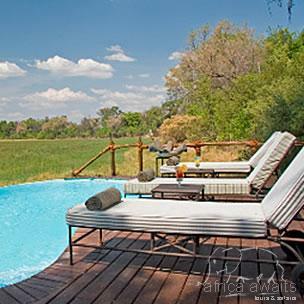 Bordering the southern section of the famous Moremi Game Reserve, this private concession is located by definition in seasonal Delta. Game viewing in the area is extremely good with excellent numbers of predators and plains-game on offer. The area houses one of the largest buffalo populations in the Okavango Delta. In the dry season, the population can concentrate into a herd in excess of 2000 head. Walk with the Elephants: Elephants can live for 70 years so when Doug and Sandi Groves adopted Jabu, Thembi and later Morula, rescuing them from culling operations that had left them orphans, they knew they were making a life-long commitment to the trio. The activity encompasses a leisurely paced walk with the elephants, becoming personally acquainted with them, observing and interacting with them and a picnic lunch in their company. 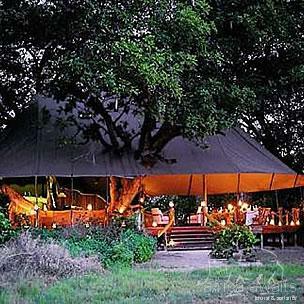 With your holiday, safari or business trip from in to Stanleys Camp in Botswana.